Launched in 1990, the Human Genome Project brought together international researchers to map the human genetic code in the largest collaborative biological project to date. It resulted in better methods to establish connections between genetics and disease and, ultimately, better ways to determine treatment. But Mapping the Human Genome did more than advance health – it advanced the economy. As of 2010, the $3.8 billion project had driven more than $796 billion in economic impact and created more than 310,000 jobs by one estimate. Could Mapping the Chemosphere have the same results? SPEA professor Joe Shaw believes it could. 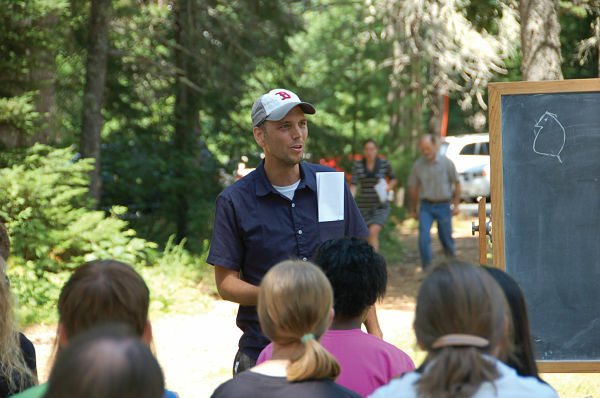 Shaw, an expert in environmental toxicology, leads the Environment Care Consortium, a collaboration of researchers in seven countries that formed in 2012 to advance the understanding of and response to toxic chemicals in the environment – the focus of their Mapping the Chemosphere project. Joe Shaw talks about daphnia. 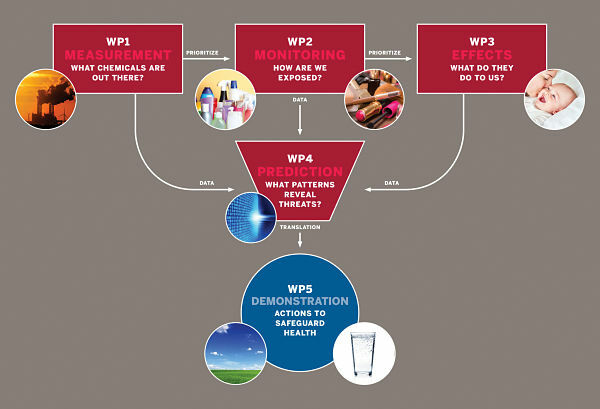 Mapping the Chemosphere brings together international experts who are working on technologies to proactively map chemicals in the environment, determine which of those chemicals cause harm, and find patterns to predict problems before they happen. More than 50 researchers involved are from Indiana University. The group’s goal is to develop a toxicity database of 10,000 chemicals and chemical mixtures with a scalable system capable of providing a complete picture of the chemosphere to drive global solutions. These solutions will not only benefit human health, but the health of the planet and the economic health of industries that understand making safer products is not just good for the world, it’s good for their bottom line. 1. Measurement: What chemicals are out there? Mapping the Chemosphere will use lab-based mass spectrometry and field deployable sensors to identify chemicals and chemical compounds in four partner cities— Beijing, China; Birmingham, UK; Bloomington, Indiana; and Chicago, Illinois—to produce chemical maps. 2. Monitoring: How are we exposed? A variety of sensors will be used to understand what people are exposed to and where. In Chicago, the project proposes to fit honeybees with air safety monitors. Also to be incorporated in monitoring are the same chemical absorbing wristbands that Michael Hendryx of the IU School of Public Health-Bloomington, Jessica Gall Myrick of The Media School, and Marta Venier and Amina Salamova of the IU School of Public and Environmental Affairs have used in their work investigating health problems related to mountaintop removal mining. 3. Effects: What do they do to us? Rapid testing on roundworms, fruit flies, water fleas, frogs, and human cells will be used to determine health effects of environmental chemicals and to identify molecular events producing toxicity. 4. Prediction: What patterns reveal threats? High-performance computers will be used to analyze the data and to identify toxicity at a molecular level, be able to predict health risks of chemicals tested, and develop a scalable database to characterize the potential toxicity of other chemicals. The knowledge learned will be applied to a set of demonstrations in the project’s partner cities that are designed to minimize health threats from toxic chemicals found in the air in Chicago, water in Birmingham, and food safety in agriculture in Beijing. In Bloomington, demonstrations will help people make healthier decisions in how they interact with the chemosphere through app-based education programs. “To get all of this cooking takes a huge investment,” Shaw acknowledges. But, once adequately funded Shaw feels, like the Human Genome Project, Mapping the Chemosphere could be largely completed within a decade and deliver a huge return on investment. In 2016, the project, then referred to as “Transforming Environmental Protection and Health for Indiana and Beyond,” was one of five finalists selected for IU’s Grand Challenges research program, which offered up to $300 million over five years to address urgent issues facing Indiana and the world. As “Mapping the Chemosphere,” the Consortium also applied to the 100 & Change Programme, a global competition for a single $100 million grant from the prestigious MacArthur Foundation, and again the project landed among the top. Ultimately, Mapping the Chemosphere did not receive a grant from either multi-million dollar opportunity. The exposure from those applications, though, has increased interest in their project as they continue looking at other philanthropic opportunities for funding. Shaw says the IU Foundation has been working overtime in identifying avenues for revenue, and he feels the support from Indiana University and SPEA.